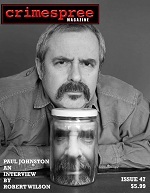 Paul Johnson is interviewed by Robert Wilson in the 47th issues of Crimespree Magazine. Ayo Onatade talks with Matt Hilton while Tom Piccirilli is interviewed by Dave Zeltserman. Lisa Unger talks about a trip to Tampa’s Big Cat Rescue with Jon and Ruth Jordan and Erin Mitchell. Bryan Gruley gives the low down on his books. 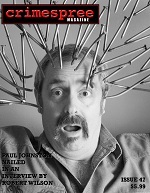 Short fiction in this issue is provided by Josh Green and Stephen D. Rogers. Reed Farrel Coleman–Drop Deadline; Craig McDonald– The Black Dahlia: A Dark Anniversary; Amy Alessio–Teen Beat. Plus several other surprises. Oh yeah, DVD Reviews, Buzz Bin, Book Reviews and Comics.